First off -please don't use this as a definitive guide when purchasing your TR7 or TR8! There is plenty of good advice available and you should do your research thoroughly prior to entering into any agreement. It may be advisable to join a Triumph or TR specific club before buying your vehicle, as they may well have a member in your area who will go with you when viewing a car, or maybe a member who lives near the vehicle if it's a fair distance for you to travel. If the TR7 is just one of several classic cars that you are considering, and club membership may not be cost effective then dip into one of the TR7 forums... like our one! What's the best model to buy? It's true to say that the early TR7s suffered from a lack of build quality. As with any new model the early vehicles tend to suffer teething problems, this is as true now as it was in the 1970's - look at the BMW mini... it's better to get a later model than one built in the first 18months or so, problems are found and improvements are made along the production line to rectify these. In the case of the TR7 the problems ran deeper, a relatively new factory in Liverpool was used to build the car (rather than the TR marques ancestoral home of Coventry) disaffected staff and poor quality control lead to a poor finished product. The move to Canley (in 1978) saw over 200 improvements made to the vehicle, including a new source of the steel used for the bodywork. Towards the end of it's life production moved again - this time to Solihull. These very last vehicles are seen as the best of the bunch, with the drop-head (DHC) being the most desirable. Generally the DHC carries a greater value than the closed top models, with the latter being particularly undervalued. If you are not too fussed about open-top motoring then the FHC (closed top or 'tin lid') is likely to return a better car for the same money. If you are intending to use the car regularly or for long journeys then the FHC does make practical sense. Whatever it is you are after - a drophead, fixed head, one in need of rescuing, a fully restored concours model or an okay vehicle for daily use you should decide what you want and stick to it. There are enough examples available for you to find the right car at the right price. Also consider the cost of restoration and the time!! Most TR7 specialists have a waiting list for restoration work - if you want a car restoring and want it on the road in two or three months time you had better start phoning around very soon!! Before we go too deep there are some basic visual checks which may highlight problems or maybe a shady history. Decals are one thing we can check. During the production of the TR7 the decals were changed on each move of the assembly line, at a glance we can see just how original the car is - decals are only a minor point but they may show up a dishonest seller. Other markings include coach lines along the vehicle length - these had 'TR7' on the rear wing close to the cruise light (or blanking plate). The stripes were either gold, silver or black depending upon the colour of the vehicle. Early models also had a small square 'BL' badge on the front wing (close to where modern cars may have their side markers), during a restoration these are usually 'lost'! The last of the vehicles (those from Solihull) had a plastic '2.0 litre' badge on this wing. It sounds obvious but if the car has been restored ask to see the photo's. Most owners who have restored themselves or forked out for a professional restoration will have enough photographs to lull even the most dedicated insomniac to sleep. What you don't want to do is pay top dollar for a restored car only to face having to pay for major work a year down the line, as the corner-cutting becomes apparent. Sills - some people skimp when it comes toreplacing the Sill. You shouldn't!! The sill provides a fair amount of strength and rigidity to the car, so check that the sill is a full-length one and not an inferior 'sill cover'. The full-length one will continue behind the front wing. Inner Sill - again a common check on new cars, especially checking for crash damage. Peel back a bit of the carpet if you can - depending how well the carpet is fixed and whether sound deadening has been used this may be easy or not possible! If you can pull back the carpet have a look along the seam of the floor to the sill. The picture here is a bit extreme but does show what you may find. Rear inner sill - the is susceptible to letting in water, this isn't a problem if the drainage channels are clear. Behind the rear wheels there will be a 'well'... hopefully not water filled! It is common for the drainage holes to become blocked, thus trapping water. Ensure the holes are clear, don't be afraid to poke around on the rust check, more so on the radio antenna side. Spare wheel well - as with No.3 above there should be water outlets within the recess, so remove the spare and have a look. Some areas of the car cause more rust issues than others.... seams from the front headlamp surround (front apron) where it ajoins the front wing is one such area, as is the rear deck where that fixes to the rear wings. The latter is more of a problem on the FHC where the wing is higher than the deck. On the FHC check the sunroof fixings - in the case of a webasto (vinyl sliding sunroof) problems can be costly to rectify due to the lack of availability of parts and specialists. The frames used on this type of sunroof are wooden... do they feel wet or spongey? Trapped moisture may rot the roof from inside, a visual check would be to look for staining of the vinyl headlining inside the vehicle. Nearly finished on this section! Another big problem area, and one that is difficult to spot until the problem is advanced is the condition of the windscreen surround. There's two issues here (or just the one if you are viewing a DHC!). The first being that hidden by the chrome trim, during inclement weather water will run UP the screen (errr only if you're moving!) and will go under this trim. If the windsreen bonding is not 100% water can get into the car or sit along the top of the glass, inviting rot to eat away the front edge of the roof. Check the alignment of the chrome strip, it should be fitted snug to the window with an even fitting along it's length. The other problem can be hidden by the black finishing strip at the base of the windscreen - water will sit behind here and eat away unhindered (a good tip is to drive the car after washing it to force the water out!). Excessive corrossion can be seen if the flat areas at either side, lift the bonnet here, have rot intruding into them. Windscreen fogging can also be an indication of a deeper problem. What about the bonnet though? The air intake into the heater (for the interior) has nice round bits and a mesh.... devilishly difficult to get the paint to stick in these areas, and tricky to de-rust, as with the vents on either side of the bonnet. Check the underside of the bonnet for rusting and look for chipped paint in these areas too. The mechanics are simple which is one of the great things about old cars... most problems can be easily diagnosed without the hassle of finding the 'diagnostic' inteface and a laptop computer. The TR7 like all British Cars is fitted with an external lubrication system which protects the engine! Otherwise known as 'yes it does leak oil'. Check for excessive oil usage, the leak should not be so much that you need to top-up weekly, but will be enough to require a tray if you don't want to ruin the block paved drive!! If the vehicle you are looking at is an early model does it have a 4 or 5 speed transmission. The USA got most of the early 5 speed vehicles - due to a supply problem European vehicles in those early days tended to get a 4 speed box. If you are looking at a 1976/7/8 model and it has a 5 speed transmission check the history - if this has been fitted later has the vehicle got the correct differential? Ideally you want to take the vehicle on a decent test drive, ensuring the car gets warm and a good mix of driving conditions - built up areas, open road and dual carriageway. Do not be suprised by a 'clunky' gearbox when the vehicle is cold, the gearbox (5 speed) is 'splash lubricated' and can be quite awkward in the first mile or so (as with an automatic car you should not attempt to tow a 5 speed TR7 unless you raise the rear wheels clear of the road). If you can't drive your chosen vehicle away it's better to get it home like on the back of a trailer than on the end of a rope being pulled by your 'daily' car. Again on the 5 speed transmission.... When travelling does the gearbox whine? If you think you hear a whining put the car in 4th gear, has the noise gone? Fourth gear is direct drive and will not whine like the other gears, if your vehicle has this problem the gearbox may need replacing/reconditioning. Spares are plentiful and not too costly - the cost is in the labour charges. A problem of this nature should not preclude an agreement but can be used as a bargaining chip. Warped heads are a problem and can be difficult to spot - hence the need for a good test drive. The issue is the uneasy alliance of a cast block with an alloy head, the rates of expansion between the two are the root cause. If the temp needle rises to 3/4 (considerably before the red) it's too late the damage has been done. First off check for a heater by-pass... you may not notice this until you need to blow hot air into the cabin one day! If the heater matrix has been by-passed it's a good indication that a hose split, if that's the case the car may have got too hot and warped the head. The best way to check is take the car for a run. If possible sit at a constant 60 or 70 on a dual carriageway for 10 miles or so (if possible 20!) the car should behave impeccably. Come off the dual carriage way and sit in a layby with the engine idling (or revving at around 1500rpm), if the head is warped the temp guage should rise significantly toward the 3/4 mark within 5 minutes. This is not a foolproof method but should help spot any problem. During the test drive check for warped brake disks, again this a standard test that you would undertake for any prospective vehicle purchase. If you get steering vibrations at 50-60mph don't worry!! 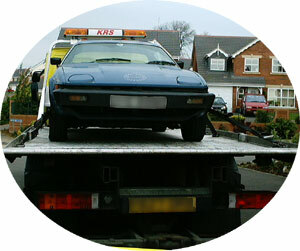 This appears to be a 'feature' of the TR7 and not necessarily an indication of a buckled wheeled or a balancing issue. This is not the "buyer's bible"!!! Merely a guide with some pointers... continue to do your research, seek advice from other owners and don't be afraid to ask questions. A genuine seller will not be worried by the time taken - in fact they should recognise that you are not a time-waster by the research that you have done. If you are buying from a dealer check them out! Are they a classic car dealer, a Triumph specialist, or just a backstreet Harry who happens to have come into possession of this 1970's sportscar? If the latter will he really know anything about the car? The TR7 is usually maligned by those who've never sat in one, let alone driven one and an uneducated dealer is probably best avoided. Always consider the options... is it better to buy a tatty cheap vehicle and carry out (or commission) the restoration yourself, or buy a restored vehicle? If you follow the former route you will at least know the car is solid, and you'll also get a set of photograph's to bore that insomniac we mentioned earlier into a coma! Any other questions or remarks please contact me!